This week, much of the UK genealogy community is readying itself for the annual, 3-day Who Do You Think You Are? Live, at London's Olympia, which claims to be the "biggest family history event in the world". This show grew out of the Society of Genealogists' annual fair, which, until 2007, was held at the Royal Horticultural Halls in Westminster. Sadly I didn't manage to attend many of the original events as they were held over the early May bank holiday when I was often away. But after the Society teamed up with the very popular TV series, Who Do You Think You Are?, it transformed into a much larger event and was moved to February. Since then I haven't been able to stay away. These are a few picture I took at last year's event. I had meant to blog about it later but got too busy! Although WDYTYA? Live is still primarily a UK focussed event, this year's theme is immigration and emigration. So shall we expect more of an international focus? There certainly seem to be a few more talks focussed on overseas ancestors and their records, fitting with the "migration" theme. I also know of at least one specialist genealogy tour group coming over from Australia, specifically for the event: Liz Doyle, of Customised Heritage Tours is bringing a small group to London and is already taking bookings for 2014! However, I suspect that the focus of WDYTYA? Live will remain primarily British. In a few weeks time, there is another large genealogy event, Rootstech 2013, being held from March 21st - 23rd in Salt Lake City, Utah, which I shall be attending for the first time. From what I can tell, Rootstech is more of a Conference with an Exhibition hall (Expo) attached; whereas WDTYTA? Live is more of an Exhibition hall with talks alongside. I am really looking forward to both and it will be interesting to compare them. If anyone is still thinking of attending Rootstech 2013, their early bird pricing ($149 for the full 3 day conference) has been extended to 22nd February. According to the Ancestry Insider, there will then be a last chance price of $179 before the final price of $209 kicks in. Although I expect Rootstech to be more American in flavour, I know of quite a few British genealogists going this year, several, like me, for the first time. If you can't make it but would like to follow what is going on at Rootstech 2013, some of the talks will be live-streamed (I watched many of these last year) and I shall also be blogging from inside the conference. As the first Rootstech official blogger based in the UK, I am aiming to report on issues of interest to UK genealogists as well as feed back what the UK genealogists think of Rootstech. Originally started with a definite "technology" focus - there is still a "Developer Day"- this year sees the addition of a new "Getting Started" track, aimed particularly at beginners. So it looks as if Rootstech is now aiming straight at the mainstream genealogy community in much the same way as WDYTYA? Live. While writing this post, I have also been contemplating the increasing globalisation of the genealogy world. The major online providers (Ancestry, FamilySearch etc) are already working hard to bring us more and more access to global archives. Some genealogists already offer to carry out research internationally while others tend to specialise geographically, simply due to the traditional nature of paper records. But as more and more archives chose to digitise their collections, largely for reasons of preservation, I suspect that the availability of online sources will only accelerate. The skill of the genealogist will be "knowing where to look" and then, putting the whole story together. Over the past year I have worked for two separate clients whose ancestors travelled widely, as merchants, in the early to mid 19th century, from as far afield as China, Singapore and Thailand, to Vancouver, Virginia and Jamaica. These ancestors disappeared from (or never appeared in) the UK censuses because they were simply living and working elsewhere. They weren't actually emigrants as such, because sometimes they (and their descendants) returned home at the end of their lives. In both my cases, they sent their children home to be educated. But without the wonderful availability of online sources, especially the wealth of information on sites such as Google books, I doubt it would have been possible to track down these families, the trail would simply have gone cold. I am therefore writing this with an increased optimism that this increase in global genealogy is only a good thing for the future of our family histories. I shall be attending both WDYTYA? Live and Rootstech 2013 with these thoughts in mind. I too will be at WDYTYALive, but have been curious of the Rootstech show - although I don't have any genealogy connections to the US - so a bit concerned that I'd just end up attending American-centric conferences that wouldn't be relevant to my research. I was a bit dismissive of WDYTYALive initially as I didn't attend the workshops on my first visit. I gave it a second chance and found that I really enjoyed the workshops and talks alongside the exhibition stands. I'll be interested as to what you make of Rootstech as a UK researcher. Thanks Andrew, maybe this year we can actually meet, instead of just tweeting from the same session as I believe we did last year. I have been a foreign Official Rootstech blogger from Australia for the past two and the 2013 Conference. I think a major difference with WDYTYA is that Rootstech's focus is more on the conference program than the exhibitors. While a number of the talks have a US bias most have international appeal, the speakers my use US examples to demonstrate a point but the tools and concepts they discuss are relevant to all. Most of the presenters at Rootstech are from North America butthere are a few foreigners like me on the program. With its focus on technology Rootstech offers a program that this little old granny from downunder could not experience anywhere else inthe world. 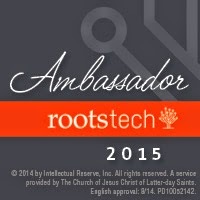 I would encourage foreigners to attend and present at Rootstech to strengthen its international focus. Thanks for this Jill, and I look forward to meeting the other "foreign" official blogger at Rootstech and comparing notes.